Download our new white paper to learn why speech and language will play an instrumental role with vehicle automation, both during the SAE Level 2-4 transition period as well as in the level 5 end game. 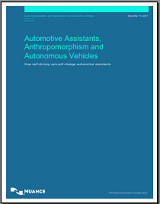 Understand how the role of the automotive assistant will change from being an assistant to the driver to becoming a spokesperson of the autonomous vehicle’s functionality. Which role speech-enabled assistants play in transfer of control (ToC) in semi-automated vehicles. How speech-enabled assistants generate trust in autonomous driving vehicles. What people will actually do with their additional free-time in a fully autonomous vehicle.